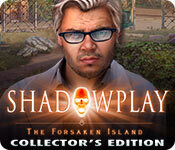 Shadowplay: The Forsaken Island Collector's Edition is rated 3.8 out of 5 by 27. Rated 5 out of 5 by josephine818 from Intriguing Plot, Well-Done Voice Overs and Great Graphics One of the best games I've played in awhile! There's nothing worse than dialogue that doesn't match the character or is monotone. Not so with this game developer. The music complements the settings, which are unique and not your average scary, old house. The plot held my interest and most of all made sense even though there's a supernatural element to it. Contained several types of puzzles, but none were too hard, which is what I prefer. Any Shadowplay installment is usually an instant buy for me, and this one was no different. Rated 5 out of 5 by timothya from Four And A Half Stars For Mad Head Great Dev, so my expectations were high and they were met. Straightforward plot, plenty of puzzles, nice balance between them and the HOS. It's a sister-to-the-rescue game, but Bro gets his mouse time in the Bonus game. Pros: nice bright graphics, very good music, excellent voice acting. Linear, logical plot with not as much back-and-forth as the previous entries in the series. Enough scenery to make it an enjoyable viewing. Cons: fairly short game, puzzle difficulty (with one exception) is only intermediate and not adjustable. A little more detail on the villains might have been nice. Overall, a solid entry in the series, with a couple of jump-scares and a happy ending. Very enjoyable game. Rated 5 out of 5 by charlene_lane from HELP YOUR BROTHER MARK REVIEW OF COMPLETED GAME AND BONUS I really enjoyed this game. There's plenty to do in each scene and a real urgency to help Mark. The main story is about you (Erica Bale) helping your brother Mark to get off Ambrose Island. The bonus is about Mark stopping the horrible experiments once and for all. There is: * Voiceovers (with dialogue); * Accident, Hazard, Disaster, Catastrophe and Custom modes; * 10 Achievements (some with 3 circles); * Find 1 spiral in each scene throughout game and bonus; * Interactive map; * Extras like an ultimate puzzle; ultimate HOP, etc. The graphics are gorgeous and each scene is perfect and well defined. Colours are muted, so not hard on the eyes. The music is mainly orchestral, guitar and piano. 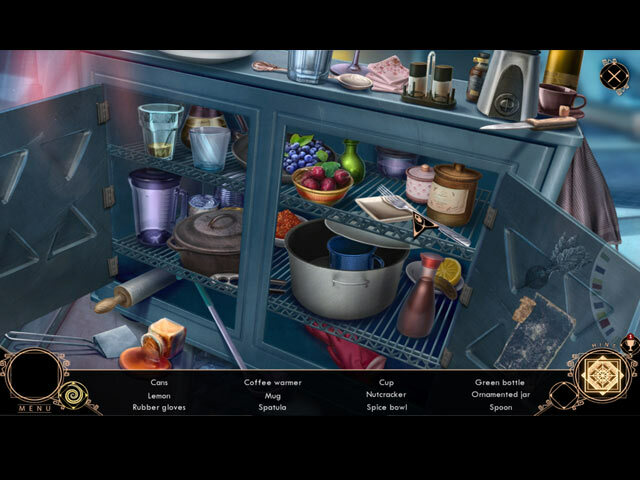 The hidden object games are interactive silhouette, straightforward, finding pairs and my ultimate favourite, the sliders (where you have a slider going downwards and one going across and you have to blend certain objects). Keep an eye out for that ever elusive morphing object in each HOP. Get them all and you get an achievement. You can go back and redo all the HOPs once the game is finished to get 3 stars. I only managed to get 2 stars in some of the HOPs because some take a while to do. However, I loved them all. The mini-games ranged from being very easy to medium. A couple (like pass through all the tiles with arrows and match the lines to make a picture) took me a while to achieve. Its not like they are too hard, but there are a lot of variables to finally get to the end. These are all good fun to do and I was never bored. At the end of the game you can play the ultimate puzzle, ultimate HOP and replay any of the HOPs to try and get 3 stars. You can also collect any spirals that you missed or decided to do all at once in the Extras as well. All up the game, bonus and extras took me about 5 hours to do. I really enjoyed playing the game and looked forward every day to playing it. Overall, its definitely worth investing in this game as it has everything that we want - good graphics, enough of a challenge to want to keep playing, terrific HOPs and mini-games - yep very happy. Definitely comes recommended. Happy playing fishies. Rated 5 out of 5 by RPgames from Very good game Very good game . I was disappointed in the bonus part because it was real short/ Used my two free games on this so I should have checked if there was just a regular game instead of the Collector' s Edition. Rated 5 out of 5 by biscuitsmama from FORSAKEN ISLAND IS DEFINITELY ONE OF THE BEST GAMES IN ALMOST A YEAR Shadowplay The Forsaken Island is an incredibly good game. I found the storyline different (thankfully) and, not only is it good, it is well-told. The game is sort of a sci-fi, futuristic game where we have a look at a possible apocalyptic scenario when scientific research gets a bit out of control. Everything about this game is perfect for me with realistic characters and dialogue. The dialogue is not filled with mistakes and it looks like someone took the time to make sure that the final product was worthwhile. Because I loved the beta for the game, I purchased it a full price because I can’t wait for a sale to get my hands on this game. There have been so many disappointing HOPA CE games since mid-2017 and it is refreshing to see a game that is actually excellent in so many ways. This game hits the target in all areas for me so it feels like 5-stars aren’t really enough. The HOPS are excellent and varied with some new styles included among the very creative scenes. The storybook types are okay but those are rather comic book in style. There is one HOP that had me scratching my head because I felt like it was more of a puzzle than a HOP but I finally got going and it did make sense to be classified as a HOP scene. 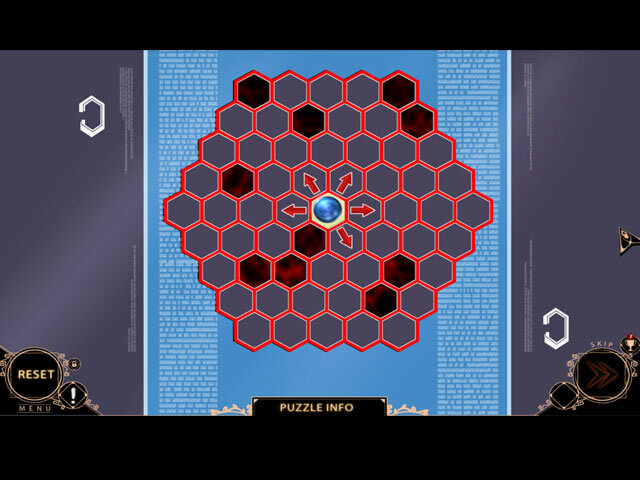 The puzzles are really very easy and perhaps will be too easy for many expert gamers. If you play a lot of HOPA games I am sure that you have already seen the puzzles before and they will be easy for you too. The CE bling is fairly standard with nothing outstanding in the package. What attracted me most was simply the storyline and I couldn’t wait another month until the SE release to play the full game. In this CE package we have morphing objects and the standard collectible Mad Head Logo. Most value comes with the in-game Strategy Guide and having that bonus chapter. Even though you know by now that I love the game and immediately purchased it, I always recommend that you try the demo to see if Shadowplay The Forsaken Island is a game you will enjoy. Happy gaming! Rated 5 out of 5 by Jade1953 from Mad Head Games WOW - very fun game :)! The right amount of mystery and challenge [for me, anyway :)], music - wait - WAS there music? No idea; I was too caught up in the story and game play to pay attention. Bonus game was good, too. Rated 5 out of 5 by irishldy60 from AHHHHHHHHH Jumped A Few Times It has been few and far between my reviews as there has not been many good games out there lately, But this one is really good in my mind when it made me jump a few times lol. I really had fun playing this game, and the visual/sound/and vo are very very good in this game. I am told that there is an extremely toxic environment so we are suiting up to go check it out and also to see if my brother is still alive too but we start to see ghostly apparations that made me jump more then a few times. The HOPs are fun to play and the storyline is a good one. The Demo was excellent and if you like sci-fi then you are going to love this game. I highly recommend this game and I sure will be buying this game. I have not bought a game in a long time so this is going to be a blast for me. Have fun playing and deceiding for yourself. Rated 5 out of 5 by pennmom36 from THE DEAD ARE RISING Three years ago, there was an accident at the Corp Tex facility on Ambrose Island, rendering the environment extremely toxic. Drones deployed to search for survivors, were unable to detect any signs of life, so everyone is presumed to be dead, including your brother Mark, that is, until an emergency beacon was activated less than 12 hours ago! How was anyone able to survive for three years in a toxic environment? Better question is, who or what is the survivor!? Welcome back Mad Head Games!! Thanks for returning to your Shadowplay roots, with another amazing game that tops the creep charts. At one point in the game, I actually jumped because I was startled by an action in this game. This has NEVER happened to me before EVER! I will even go as far as to say that this game has by far, the best cliffhanger demo ending, an ending that leaves you hanging, an ending that entices you to click the "buy now" icon as fast as you can. This is exactly what I did, and I'm keeping my fingers crossed that when I return to the Island, to finish the story, it won't let me down, but after all, this is a very, very, Mad Head World! My only disappointments are that the only CE bling offered are those same boring collectible Spirals (they stick out like a sore thumb!) and they once again only offer Morphs within the HOP's. 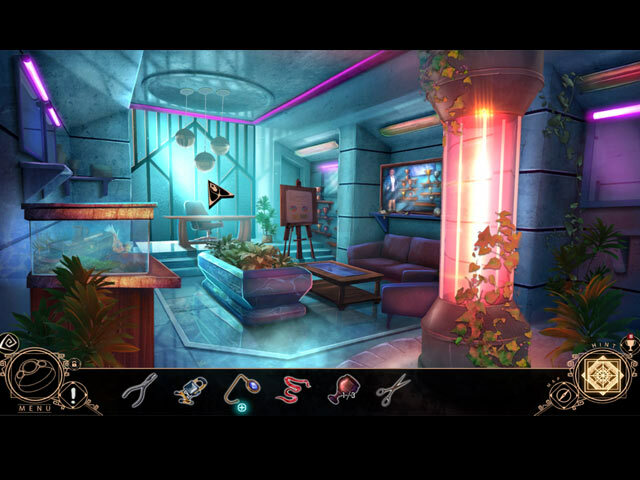 The Hidden Object Scenes are decent, but nothing special, nothing new offered. There is a Morphing Object within the main HOP's in this Collector's Edition version, a feature that would make me jump for joy, IF they were offered in each location scene of the main game, NOT within just the HOP's Some of the HOP's require you to locate 4 items that will then open up an Interactive List find, and some where the items found move aside to expose a puzzle fragment, as well as Silhouetted Shape finds, or combinations of both types of HOP's. There are several Zoom Zone HOP's that have just a handful of Silhouetted Shape finds, but at least in the demo, there are no alternate puzzles offered to play instead of the HOP's. There are also Keywords in Sentence finds, but they are categorized as Mini Games not HOP's. The Mini Games are actually entertaining, and for the most part, are fairly easy to solve on the first attempt. Below are brief descriptions of some of the games you'll encounter during the demo: 1) Select a button to move the dial either 3 spaces clockwise or 2 spaces counterclockwise, to land on each symbol shown on the clue. 2) Select arrows to move the spheres into their matching colored disks. 3) Repeat the sequence of images lighting in the order shown. 4) Select a series of numbers that equal the sum shown, by clicking highlighted available numbers, and ending with the highlighted red button on the bottom right corner. 5) Swap fragments to fit correctly into their matching patterned slots. 6) Select matching pairs of symbols (MH does love their symbols) 7) There are several story based puzzles that require you to find items that match the keywords shown in each paragraph of the story. SHADOWPLAY GAMES AVAILABLE Title***Collector's Edition Release Date***Average Rating 1-Darkness Incarnate (August 20-2016) 4.1 2-Whispers of the Past (July 27-2017) 3.4 3-The Forsaken Island (February 1-2018) n/a by: Mad Head Games This Collectors Edition version has 4 Wallpapers and Concept Art pictures, 6 Music Soundtracks, an Ultimate Puzzle, replayable Hidden Object Scenes, a Showcase Room, 10 Achievements to earn, 32 collectible Spirals to find, 18 Morphing Objects within the Hidden Object Scenes, a built in Strategy Guide and a Bonus Chapter, enjoy your stay on Fantasy/Forsaken Island!